THE 17-year-old suspect in the murder of Christine Lee Silawan has been released. This was confirmed by his lawyer, Vincent Isles, who told SunStar Cebu that the victim’s ex-boyfriend left the Lapu-Lapu City Social Welfare Office at noon Saturday, March 23, a few hours before Silawan was laid to rest. In a resolution issued on Friday, March 22, the prosecutor’s office ordered the local social welfare office to release John (not his real name),pointing out that his warrantless arrest by the National Bureau of Investigation (NBI) 7 last March 16 was invalid. The prosecutor’s office terminated the inquest proceedings against him and placed his case under regular preliminary investigation. It also approved Isles’ plea to allow his client to submit his counter-affidavit in response to the charges filed against him by the NBI 7. John now has a chance to present the testimony of his witnesses and will be able to refute the allegations against him, Isles added. The boy is staying in a safe and undisclosed location, he said. Isles said the development was a step forward in securing justice for his client. “In a sense this is a victory for my client, but it is also a victory for the rule of law,” he told told SunStar Cebu. Last week, Isles filed an omnibus motion before the prosecutor’s office, asking it to release his client over claims that his warrantless arrest was illegal. 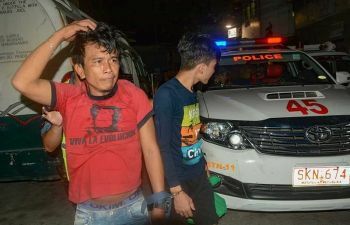 The lawyer cited a Supreme Court jurisprudence, stating that the NBI 7 had no personal knowledge or a witness’ testimony to prove his client murdered Silawan in Barangay Bankal on the night of March 10. But while John’s family celebrated his release, Silawan’s relatives and friends paid their final respects as she was laid at her final resting place at the Cattleya Gardens Memorial Park in the neighboring town of Cordova. 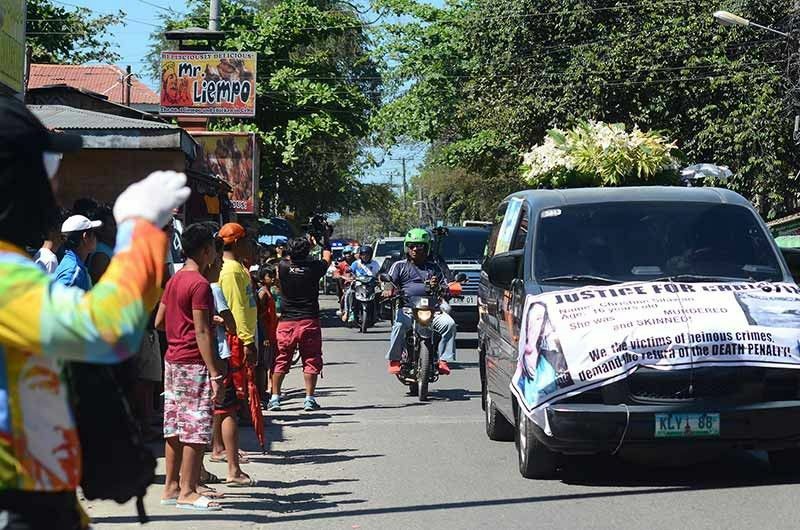 More than 5,000 people, including Lapu-Lapu City Mayor Paz Radaza and Vice Mayor Marcial Ycong and members of the Volunteers against Crime and Corruption led by their chairman Dante Jimenez, attended her burial last Saturday afternoon. The City Government deployed 25 electronic jeeps and 10 buses courtesy of barangays in the city to ferry mourners from the church to the cemetery. The requiem mass was held at the Sto. Niño de Cebu Parish in Barangay Mactan, Lapu-Lapu City. In his homily, Fr. Johndy Enanoria reminded the Silawan family about the importance of being able to move on after a tragedy. He also encouraged the family to continue praying and striving to seek justice for Silawan’s gruesome death. Silawan’s mother Lourdes Pardillo collapsed several times and had to be assisted. She refused to issue a statement to the media. The burial coincided with her 48th birthday. Her sister, Fermina Silawan-Garcia, was grateful for the support the family had received since Day 1 of their ordeal. Garcia called on authorities to find the real killers so they could be placed behind bars and brought to justice. She said she was surprised to hear the news that the suspect in her niece’s murder was released from custody. “Ambot lang ana, oi (I don’t know what’s going on). Nganong in-ana man (What is it like that)? Wa gyud mi idea pa kay naa pami sa kasub-anan (We don’t have any idea because we are still grieving),” Fermina said. Dante, in a separate interview, said the news also disappointed him. He said it only showed that the filing of charges against the suspect was made in haste and didn’t undergo the proper process. “Bakit ganun (What happened)?... Either way, hindi talaga ayos inaapura (It’s not good to rush things). Haste makes waste,” Jimenez told reporters.